Nicholas Medtner (1880-1951) has always been a neglected figure in the history of Russian music, and yet his friend Rachmaninoff considered him the greatest of contemporary composers. He wrote three fine piano concertos, more than one hundred solo piano compositions, including a cycle of fourteen sonatas fully worthy to be set alongside those of Scriabin and Prokofiev, and many beautiful songs. He was also a great pianist. Leaving Russia after the Bolshevik Revolution, Medtner lived for a time in Germany and France before finally settling in London, where he passed the final sixteen years of his life. The present work is the first to tell the full story of his eventful life and to consider in turn each of his compositions. 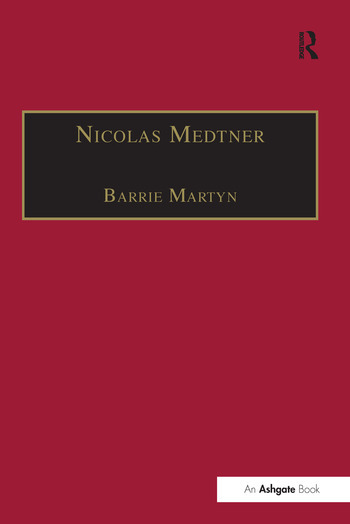 The author has drawn on Medtner’s own correspondence and writings and collected the reminiscences of those who knew him personally to build a comprehensive picture of a great, if still largely unrecognised, musician. Contents: List of plates; Acknowledgements; Introduction; 1880-1900 Childhood and conservatoire; 1900-1903 Start of a career; 1903-1906 Personal turmoil; 1906-1909 German sojourn; 1909-1911 Conservatoire professor; 1911-1914 Friends and critics; 1914-1917 War; 1917-1921 Revolution; 1921-1925 A life abroad; 1925-1927 Return to Russia; 1927-1930 Britain and America; 1930-1935 The Muse and the Fashion; 1935-1939 Move to England; 1939-1945 Second World War; 1945-1951 Indian Fairy Tale; Notes; Index of Medtner's Works; Index of persons and works referred to in the text.